Stomach cancer in dogs can be a silent killer because the animal is usually in the advanced stages by the time he shows signs of illness. Learn about the different types of cancer that typically affect the stomach, as well as the symptoms a sick dog might display. According to the Pet Cancer Center, there are several main types of cancers that are associated with dog stomach cancer. Adenocarcinomas are the type of tumors most often associated with cancer of the stomach. This cancer is one that is found in glandular tissue, and it will often spread to the liver, lungs and lymph nodes. Mast cells are part of the immune system, and they play a role in inflammation and allergic responses. These cells are present in the linings of the digestive tract, lungs, nose and skin. When mast cells become abnormal, they often form mast cell stomach tumors in dogs. The tumors release excess amounts of the biological chemicals heparin and histamine, which are normally produced by mast cells. This overdose of natural chemicals damages the body. Leiomyosarcomas are tumors that form in the walls of hollow organs such as the stomach, bladder, uterus and respiratory tract. The gastrointestinal tract is the organ that is most often affected by these tumors. This type of tumor, when found in the gastrointestinal tract, will often spread to the lymph nodes and liver. It can also spread to the spleen and kidneys. Lymphoma is a type of cancer that begins in white blood cells called lymphocytes. Although lymphomas are not the most common cause of stomach cancer, these tumors can be found in the gastrointestinal tract. 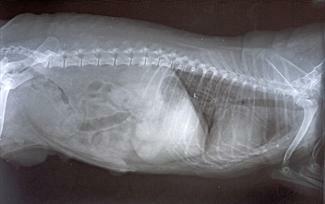 Vomiting is often the first symptom of canine stomach cancer. It is also the most common, and there should be special concern if the vomit has blood in it. Due to poor digestion, the dog will likely experience weight loss and lethargy. Cancer of the gastrointestinal tract will usually cause pain for the dog. Addressing pain should be part of the treatment plan in addition to treatment of the cancer and other symptoms. It's sometimes difficult to tell when dogs are in pain because many of them put on a brave front and are quite stoic. According to the Pet Cancer Center, surgical removal of tumors is the most common and beneficial way to treat stomach cancer in dogs if the cancer has not yet metastasized. This is the case with most tumors except lymphomas. If the tumor is preventing food from entering the stomach, bypass surgery can prove helpful even though this surgery does not treat the cancer itself. Chemotherapy does not seem to be effective for treating stomach cancer. Radiation is dangerous to the delicate organs near the stomach and is rarely considered and option as a treatment for stomach cancer. Severe weight loss is a common problem among dogs with stomach cancer. Feeding the dog a diet that is especially formulated for a pet going through cancer treatment will be critical for maintaining his overall health and quality of life. Being severely underweight suppresses the immune system and negatively affects a dog's ability to withstand cancer treatments. Dogs diagnosed with malignant stomach cancer do not have an optimistic prognosis. Many dogs do not live beyond six months even with treatment. This is largely because the cancer recurs or the tumors spread to other organs. Even so, each case is unique; some dogs will have more time, others will have less. 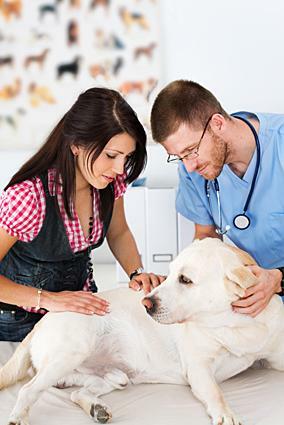 The attending vet will make an educated prognosis based on the particulars of each dog's case. Learning a beloved dog has stomach cancer can feel devastating, so rely on your vet to guide you through whichever treatment is prescribed. The most important thing you can do is try to make your pet as comfortable as possible, and show him how much he's loved.